NASBA offers its CPE Audit Service platform to State Boards of Accountancy to use as an automated tool for conducting their audits of licensee compliance with the Continuing Professional Education (CPE) requirements. Eligible boards are participating in the Accountancy Licensee Database (ALD) with licensee data records that are properly linked across state lines. 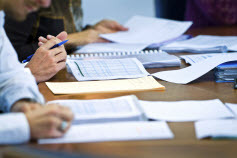 The platform is configured for CPAs to report CPE hours and documentation to the Boards electronically, and State Boards of Accountancy are provided administrative tools for evaluating submitted credits and documentation for compliance with State Board CPE rules and regulations during the audit process. NASBA is presently upgrading the legacy platform to a new version, which will go live to the currently participating Boards in the first quarter of 2019. If you are a representative of a State Board of Accountancy who is interested in a brief walkthrough demonstration of the upcoming CPE Audit Service platform, please contact Erin Buchanan (ebuchanan@nasba.org). You may also wish to review Frequently Asked Questions about the CPE Audit Service. Click here for news and updates regarding the CPE Audit Service transition.